If you are not able to reserve on the internet, it’s still possible to make a phone call and complete your reservation. We offer a FREE drink to customers who have completed the payment in advance. For customers who pay on the appointed day, the payment shall be completed by cash or credit card. Further, please be noticed that we only accept Visa, Master Card, American Express, and JCB. Other credit cards including Union Pay will not be accepted. Please refer to cancellation policy as below. The maximum is 40 people. Please send an e-mail for further inquiries. How much time will it take for all the process? It will take about 90 mins including the time you eat the ramen. Short course is 45mins. We do not provide professionals who teach customers one by one. Instead, you can look at the guide book on every table, and make the ramen on your own. If you have further questions, please feel free to ask our instructors for help. Our concept is to let customers make their own style ramen. Do we start from soup-making? The soup(broth) will be made by our chefs, the recipe has already been well used for more than 30 years. We recommend children who are above 5 years old to participate. For children under 5 years old are required to go together with adults, and shall be watched out carefully while using the kitchenware. We can also lend a playpen if necessary. We only provide you with the apron which covers the pants only, please wear your casual clothes. Is it possible to take photos? Yes, you can take photos by yourself. You can also ask instructors for help if necessary. We will charge 1000 yen as an entertainment fee. Can people with food restriction also enjoy the ramen? Please check our "FOOD RESTRICTION" know more information. Instead of using chicken, Tofu topping will be used. Whether having egg or not depends on your diet. Please be kindly noted that we might not be able to prepare the vegetarian ingredients if you don’t inform us in the REQUEST in advance. The noodle-making process is slightly different because you may have to wait a little bit longer . Other information about our ingredients can be found on the “FOOD RESTRICTION” page. How should we do for the wheelchair? There is a 5cm-high step at the entrance, and we can help you if necessary. The prayer room for Muslims is on the second floor. We also welcome walk in guest. 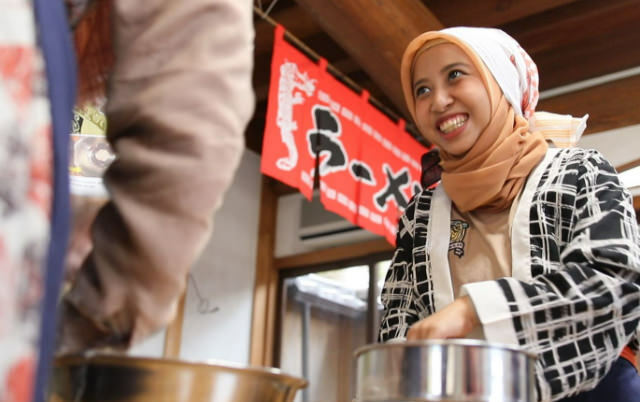 Muslims can also enjoy making ramen here without any reservation.